On Tuesday, December 4, join curator Michael Campbell plus special guests Bill Rogers and Camille Dixon for a special fundraising event, celebrating The Napa Valley Museum Yountville’s presentation of Walt Disney’s Trains, a version of which exhibition had its debut at The Walt Disney Family Museum in 2014. Guests can enjoy Silverado Vineyards wine with a private viewing of Walt Disney’s Trains before joining Campbell for a special presentation exploring the history of railroading in Napa and Sonoma Counties. Learn about the numerous Disney connections to the area, from serving as filming locations for classics such as Pollyanna (1960) to being the locale in which Ron and Diane Disney Miller decided to establish Silverado Vineyards. After, enjoy a Q&A with celebrated voice artists Bill Rogers and Camille Dixon about their special connection to Disneyland Resorts and to theWalt Disney’s Trains exhibition. We are excited to share Walt’s railroading legacy with you, celebrating its influence in and outside of Disneyland. 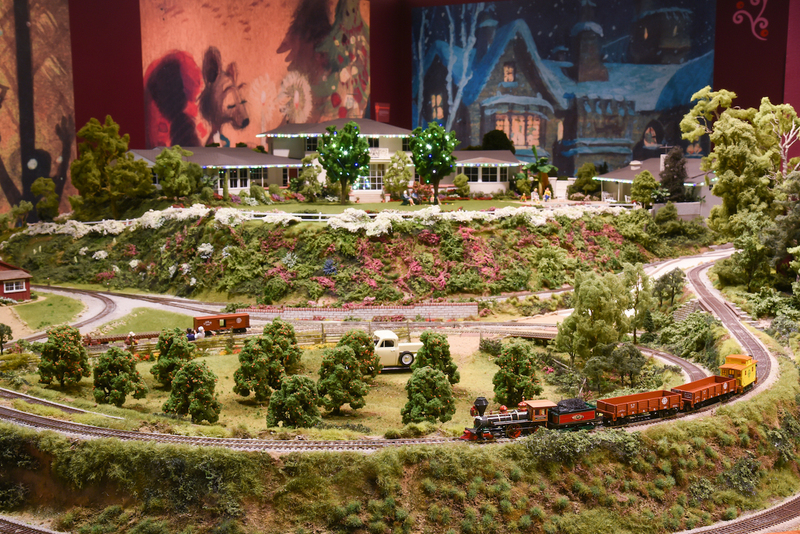 The Walt Disney Family Museum is excited to announce the return of Home for the Holidays at Carolwood, an immersive seasonal installation celebrating Walt’s family and his love of trains. The exhibition, which has been a yearly tradition since 2016, will be on view from November 15, 2018 to January 7, 2019. An elaborate, three-dimensional model of the Disney family home, which once stood on Carolwood Drive in the Holmby Hills section of Los Angeles, will be the most prominent element of the exhibition, featuring a miniature version of Walt’s steam locomotive, the Lilly Belle, traveling around his Carolwood Pacific Fair Weather Route—a half-mile track that crisscrossed the home’s lawn and flowerbeds. Decorated with seasonal lights and greenery, this colorful and intricate scale model will be ceremoniously illuminated for the first time on Walt’s birthday, Wednesday, December 5, coinciding with the museum’s free admission day. To further enhance visitors’ holiday experience, our major special exhibition, Walt Disney’s Nine Old Men: Masters of Animation, will be spreading some cheer as well: an array of never-before-seen holiday cards that were created by many of the titular Nine Old Men—a cast of influential animators who worked directly with Walt—will be displayed in Masters of Animation for the last few months of its run. These cards will complement the personal snapshots that depict Walt and his family, as well as the animation art and ephemera, that fill Home for the Holidays at Carolwood. And, for the first time, visitors can get an up-close-and-personal look at a vintage sled, which features an original, painted design of the “pie-eyed” version of Mickey Mouse.